The following is a partial summary of the conclusions from the fxempire.com weekly analysts’ end of week meeting in which we share thoughts and conclusions about the common drivers of major global asset markets: global stocks and the leading stock indexes, forex, commodities, and bonds. The exact mix varies somewhat from week to week, depending on what’s most important per prior and likely coming week market action, news, and events. You can find all of these here as they come out over the weekend. You can skim it in about 2 minutes, or take a bit more time to study it. A useful weekly summary of what’s driving global asset markets. See here for details on the lessons we learned for the coming week and beyond, and on how once again, the most potentially ominous stories were not market moving. As demonstrated by the sample of US, European, and Asian weekly stock index charts below, overall the major global indexes drifted higher to new multi-year or all-time (US) highs on light volume and no major market moving news. As we’ll discuss in our article on lessons for the coming week and beyond, in addition to a number of noteworthy lessons, there were in fact a number of significant news items, even though investors haven’t responded much to them yet. Anyway, here’s a summary of how the daily action went. Europe: Higher as Iran nukes deal raises risk appetite in general and prospects for EU firms with heavy Iran exposure, such as French carmakers. 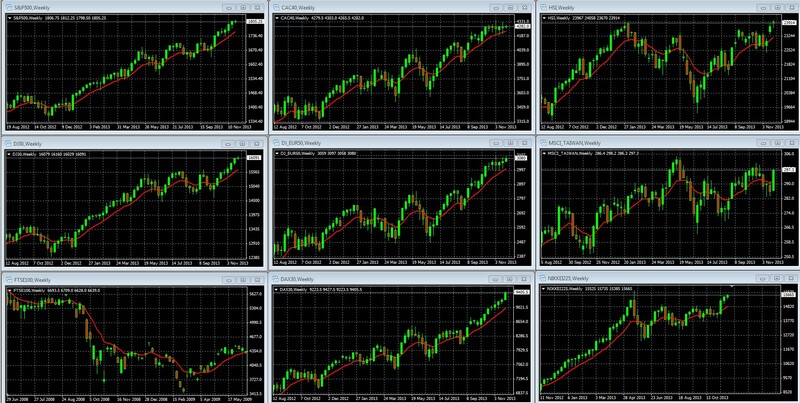 US: Indexes mixed, slightly higher overall. Despite the lack of decisive price action in global indexes overall, a few points worth noting. See here for our article about lessons for the coming week for details on all of them. ASIA: Mixed mostly lower, the only major index up was Korea, + 0.33%, as they lacked an overall driver and individual indexes were left to move (or not) based on local conditions or technical positioning. Europe: Closed mixed, mostly lower as corporate profit warnings and lower-than-expected U.S. consumer confidence data tempted profit takers and kept benchmark indexes within ranges set earlier this month. Volume was higher than usual, lending conviction to the modest to solid pullbacks. US: Indexes were again only incrementally higher, essentially closing flat for the second straight day. Asia: Indexes mixed, with Japan down modestly on a profit taking at resistance from a 6 month high, but the other leading ones overall modestly higher as Hewlett-Packard’s earnings beat was bullish for other electronics makers. Europe: All indexes up solidly, around 0.6%, on a combination of strong U.S. data, a long-awaited coalition agreement in Germany, and upbeat comments from Italian insurer Generali. Volume on the pan-European FTSEurofirst 300, however, was 25% below its average for the past 90 days, suggesting there were relatively few investors behind the rise. Many traders were away ahead of Thanksgiving Day in the United States on Thursday. The US data included better than expected results from the Chicago PMI and also the final November UoM consumer sentiment survey. Adding to evidence that the US continues to recover, weekly new unemployment claims filings fill fell more than expected. The PMI report’s showing both inventory buildup and hiring occurring together suggested that there was indeed rising demand. While durable goods orders missed expectations, the survey showed intentions to increase capital expenditures, raising hopes that the miss was an aberration that would soon correct and show increases in actual capex spending. The German coalition agreement was bullish for peripheral economies, as the SPD is seen as somewhat more pro-European than Merkel’s Christian Democrats, though the two parties seem united in opposition to softening Germany’s positions about more ECB easing, risk sharing, or the need to keep up the pace of economic reforms (austerity, mostly) in the weaker economies. US: The S&P 500 and Dow were up modestly, 0.15% and 0.25% respectively, while the Nasdaq rose a solid 0.67%, bringing all to new all-time highs, albeit on already low pre-holiday volume. Asia, Europe both up on light volume with US closed, Europe boosted by some welcomed better than expected (i.e. higher) Spain and Saxony inflation data, and Italy’s Senate expelling former prime minister Silvio Berlusconi, fuelling hopes of stability for the current government. Asia: Profit taking and rising tensions with China caused most major Asian indexes to close flat or lower, although Hong Kong and India finished up 0.4% and 1.25% respectively. Europe: Indexes closed mixed with only modest moves up or down on a day lacking both market moving news and trading volume as the US Thanksgiving holiday kept trading subdued. US: The Dow and S&P 500 closed slightly lower but were still up for the eighth consecutive week. The Nasdaq closed modestly higher, rising 15 points to a new 13-year high, helped by Apple’s 1.9% gain due to indications of strong iPad sales this holiday weekend. Early reports of strong Black Friday sales and traffic had some retailers such as eBay and Best Buy up on hopes for a robust holiday shopping weekend.